I would like to create a tracking or module or component where when each student completes X number of activities which equates to fulfilling completion of the course, they can track/monitor their progress, but also download their progress to use as proof they completed the tasks. For example 1) students must complete each module, 2) students much complete Activity A (assignments) Activity B (obtain 22 items related to assignment B, and 3) students much complete the final exam. So, I know that for items 1 and 3 I can do the checklist with no problem. Would I include 22 checklist items for item 2) to track that those items were completed by each student? Do I need to set the 22 items up as a module itself? For 22 items in activity B, students also need to write information about what they did (e.g., completed complementary session with AK on 9/1/2018 at 7 pm.) That would be item 1. There will be 22 such items like that. I want to make sure I make this easy enough and trackable. Please advise. 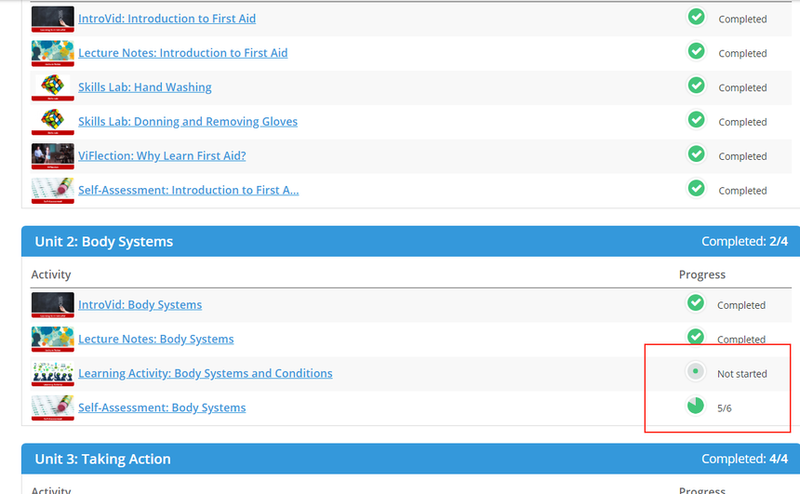 I'm not exactly sure what you mean by item, but OL platform tracks everything the students do in the course. Usually, courses consist of several modules (=units) with several pages in each one. Each individual page can consist several elements (items?) such as some text to read, a video to watch, a quiz, a task where students need to submit something they've written. Each of these can be tracked. "Not started" means that the student hasn't done anything on this page. 5/6 means that they have completed 5 out 6 elements on the page. None of these are limited in number. May I ask if you've seen or taken a course on OpenLearning's platform? The best place to start will be with our Rethink Learning and Teaching series. It is a series of a few free courses (and more upcoming) based on on our pedagogy and best practices. I'd recommend enrolling for the courses and seeing the possibilities of the platform along with our flexible, student-centric teaching practices. Alenka Prezelj Hi Alenka, thank you for your response. Let me try to be clearer. Students will have to secure practice coaching sessions. When they do, I want them to enter the initial, date and time they completed the session. So, it's more like entering in that information. Now, there will be eight students per class. They each will need to enter 20 practice sessions. With that said, what object (text, checklist, file upload) would be best to use for this and track it? Technically, I wanted to capture each item individually. But, I guess it could be a file upload. However, I would prefer it be a data entry in the system. Does that make more sense? As far as the item you provide as an example of monitoring progress, I do like that as well. I would like to set that up too. Reid Ready Training Hi! That's certainly doable, it just depends on how do you want to collect the information. Would you like to collect the information individually (from each student separately) or all of them together in one chart? Either way, it might be a good idea to create a chart (or eight) and have students enter the info in there.The chart could be a Google spreadsheet embedded in the page. You'll be able to view the charts at any time, however, you won't be notified when they enter each session info. Is this something that would work for you? If you need each session by each student to be entered completely individually, you could use Post text widget. Whatever they post is then collected in Gallery which is displayed right below.